These are old-school protection talismans and one of my favorite things to fashion. Archangel Michael Home Protection packets are worked with in the Deep South, especially parts of East Texas, Louisiana, and Georgia. 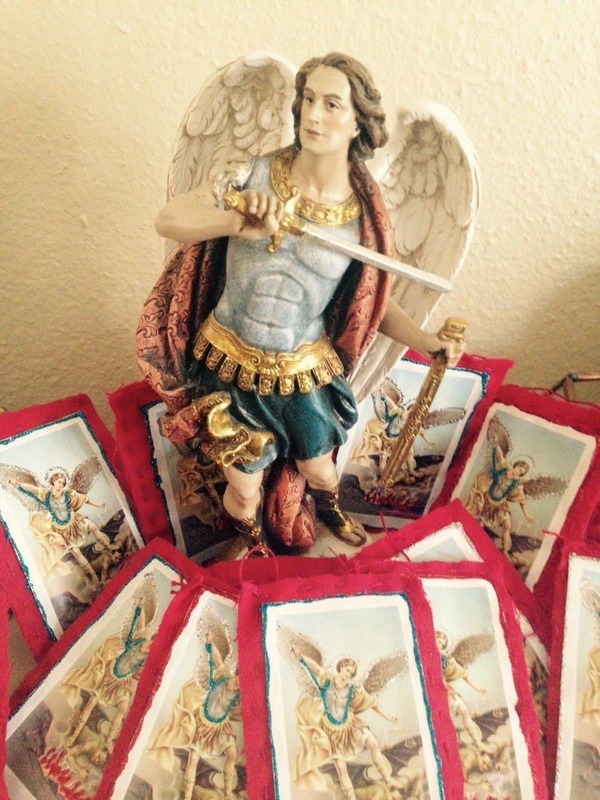 The packets are made of red flannel with a prayer card for Archangel Michael affixed to them and are filled with a traditional blend of herbs and roots known to keep one’s home and those who dwell within safe, joyful, and under the protection of Archangel Michael. When these packets are properly made the maker anoints needle, thread, and cloth with protection oils, encloses a blessing in the packet, and prays over the packet the entire time it is being sewn together. I can tell you from first hand experience that it is a *process* but a really beautiful one. The packets were originally designed for shotgun style houses (the kind of house where you can stand at the front door, shoot a gun, and the bullet goes all the way through to the back door without hitting anything). To that end, they are sold in a set of two – one for your front door and one for a back door or window. I make these packets available once a year, in September, when I also offer the Michaelmas communal ceremony. To learn more about Archangel Michael – who he is and how he might work to keep you safe, go here. To learn more about protective talismans and the idea of the “evil eye” go here. What: 2 packets composed of red flannel, affixed with an Archangel Michael Prayer Card and filled with traditional herbs and roots aligned with protecting your home and all who dwell within. Packets are traditionally hung over the front and back door or the front door and a back window. Shipping: is included in your cost. Packets will be shipped priority mail. Limited availability: I have four sets of packets. They will be sold on a first come, first serve basis.